I think I was 19 years old when I tried avocado for the first time. No joke. In my defense, I was living on Long Island and we ate according to the seasons, and fairly locally, in the old days. I don’t remember ever even seeing an avocado in our supermarkets, let alone my mom buying one and knowing what to do with it. Even when I went to college in Philadelphia, I don’t recall any Mexican restaurants on campus or avocado at the dining hall salad bars. But I do remember visiting my college boyfriend in LA over Christmas break sophomore year. There was a new fast-food-style Mexican restaurant that had just opened up in his neighborhood called Baja Fresh. I was open-minded even though I had never had Mexican food before. I didn’t eat meat then, so I ordered a rice and black bean burrito with salsa and guacamole on the side. (I seriously can’t remember where I put the new lip gloss I bought on Saturday, but I always remember food.) LIFE CHANGING MOMENT. It was like the time my son tried a Slurpee at 7-Eleven when he was 4 years old and said to my husband, “Why I not have this before?” Exciting, but at the same time, a little depressing to think of all that you have missed out on. Since then, truly since then, I have become obsessed with Mexican food. Not gross, greasy, cheesy, heavy Mexican food. I am more drawn to fresh flavors, salsas, rice, beans, cilantro, and one of my favorite foods EVER, avocado. Maybe I didn’t move to LA after college graduation to be in the same city as my boyfriend. Maybe I did it for the Mexican food. I was young and crazy. Who knows. Crazy enough that I’m still here 20+ years later and I’ve never said no to a taco. Long story short, I am always looking for new and different Mexican recipes to try on my family. There are only so many fish tacos and chicken fajitas that they’ll put up with. When I saw a recipe for Caldo Tlalpeño soup, I knew right away that this would be a keeper. 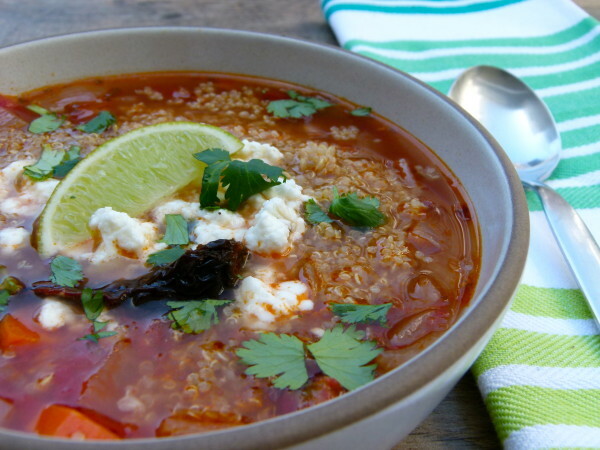 There are so many variations on this soup, which I think of as a slightly spicy, smoky Mexican chicken soup. Chipotles, which are dried, smoked jalapeño peppers, are always the star of the show. Without them, this would just be a chicken and vegetable soup. 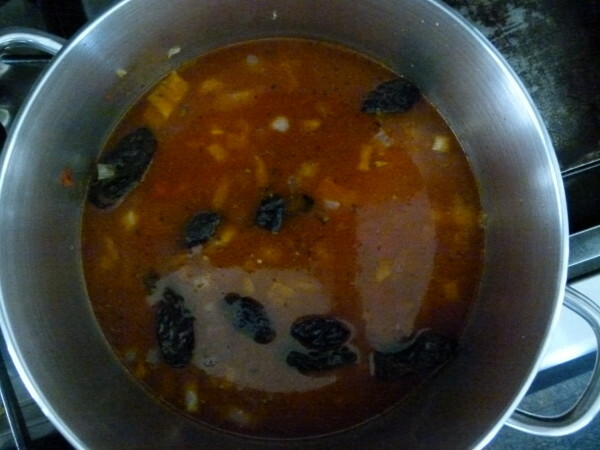 Although the ingredients in Caldo Tlalpeño vary from region to region and restaurant to restaurant, you cannot make this soup without the chiles. I have also seen versions with diced zucchini, green beans, chayote, or rice. Epazote is a traditional herb used in this soup, but it’s not easy for everyone to find, so I often use orgeano in its place. Not an exact, perfect sub, but good enough. One of my favorite things about Mexican food is adding all those great toppings and condiments. So many of my favorite dishes are incomplete without salsa or guacamole or cilantro or radishes or all of the above. The topping bar is also my secret weapon with Mr. Picky. He’ll eat almost anything if he is allowed to top it with corn tortilla chips or diced avocado. 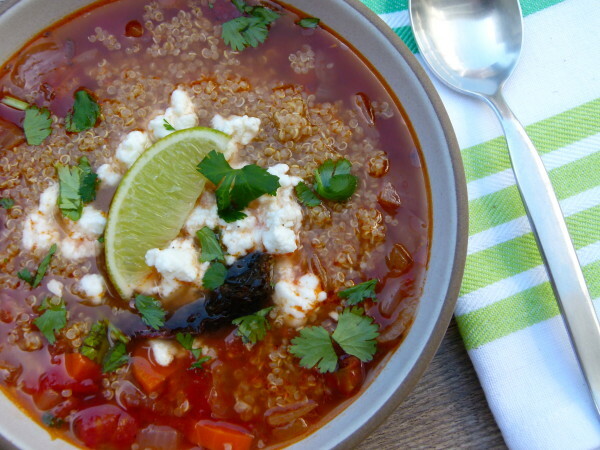 Caldo Tlalpeño is great on its own, but I make this a full meal with a little cooked quinoa (not at all traditional, but amazing here), a pinch of sheep’s milk feta (also nontraditional, but delish,) and a squeeze of lime and some fresh cilantro. So light, fresh, healthful and delicious. In a large saucepan warm the olive oil over medium heat. 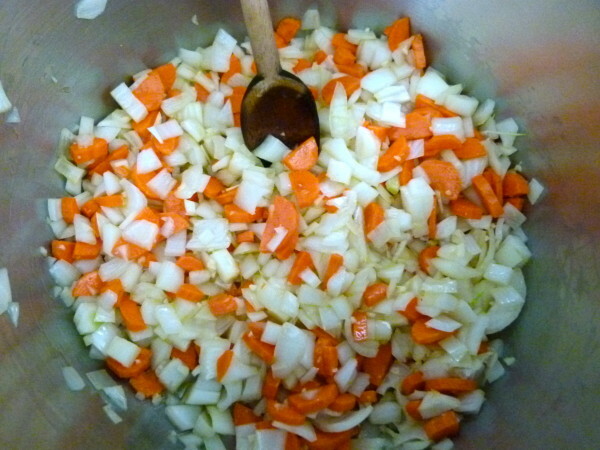 Add the onion, carrots and garlic and sauté until tender, about 6 minutes. 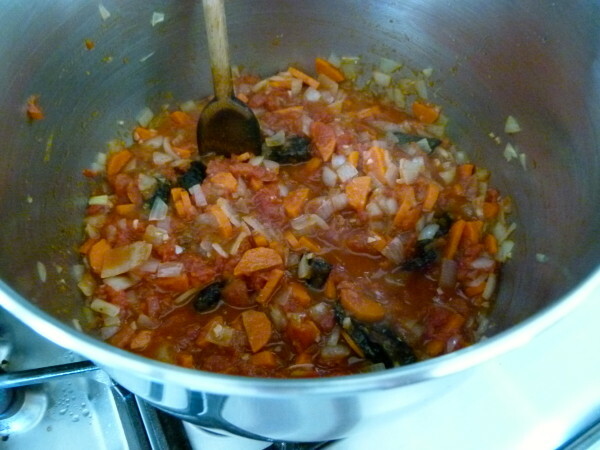 Add the tomatoes, chiles, and oregano and sauté for 2 minutes. Stir in the chickpeas, sea salt and stock. 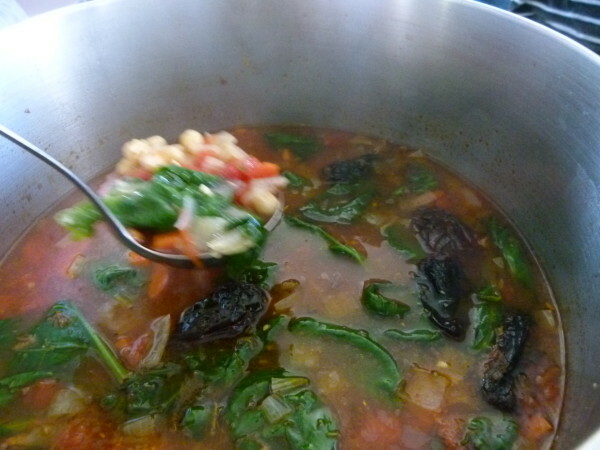 Bring to a boil and lower to a simmer. Cook covered until carrots are tender, about 20 minutes. Stir in the greens and turn off the heat. Taste for salt and adjust accordingly. Serve with suggested accompaniments if desired. 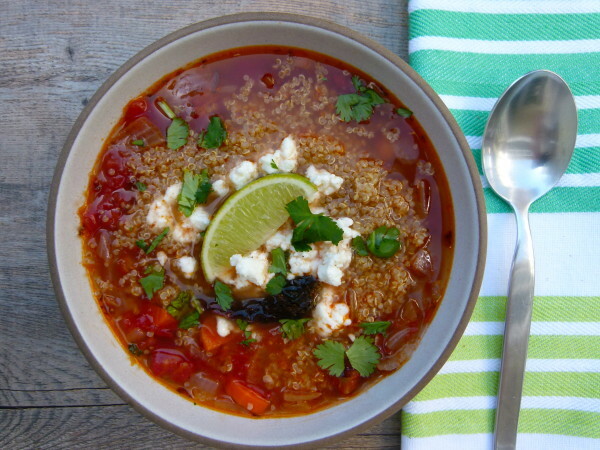 *4 chiles makes this soup about a 2-3 on a heat scale of 1-10. Eating them whole however, is quite spicy. You can dice them up or puree them with a little broth when the soup is finished and serve them with the other condiments/toppings for an extra kick. Will a regular grocery store carry dried chipotle chilis? Can’t wait to try this!